Allegheny County was created on September 24, 1788, from parts of Westmoreland County and Washington County. The county was named after the Allegheny River. The county seat is Pittsburgh, which was incorporated as a borough on April 22, 1794, and as a city on March 18, 1816. General John Forbes is credited for naming the city in November 1758 after William Pitt, a British statesman. Looking to further your research in Allegheny Co.? Here are similar books about the city of Pittsburgh. Read about Pittsburgh's former mayor and governor of Pennsylvania, David L. Lawrence. For general information and books about Pennsylvania, or to locate information about other counties, visit the Pennsylvania Page of Time Voyagers Bookstore. Don't forget to check on the parent county from which a county was originally founded. During the decades before and after 1700, the region we know today as Western Pennsylvania and Allegheny County was a vast wilderness inhabited only by wild beasts and wandering bands of Indians, principally the Iroquois, who dominated the other tribes, including the Allegewi, from which the Allegheny River, the Allegheny Mountains and Allegheny County derived their names. In 1749, the lands of Western Pennsylvania and the Ohio Valley were formally claimed for France by Captain Celeron De Blainville, who made an expedition down the Allegheny and Ohio Rivers for the purpose of burying hundreds of lead plates asserting French dominion over the Ohio, and nailing plaques bearing the arms of Louis XV to convenient trees along the route. The English also were interested in the area and Governor Dinwiddie of Virginia sent Major George Washington to warn the French away from their posts, but his mission failed and the young surveyor, on his return, narrowly escaped drowning in the ice- packed Allegheny River. In 1754, the governor sent a group of 41 Virginians to build a fort named Prince George at the confluence of the Allegheny and Monongahela Rivers. Before the English finished the fort, however, the French received word of the effort and 500 men, 60 boats, 300 canoes and 18 pieces of artillery arrived and demanded the English band surrender its fort and leave the country. The English evacuated the incomplete fort and the French then assumed command. They completed and strengthened the bastion and named it Fort Duquesne. The struggle for possession of the fort developed into one of he principal objectives of the French and Indian War. The British, fearful for the safety of the western boundaries of their thriving American colonies, sent an expedition under General Edward Braddock to retake the fort, but the effort was an unqualified disaster and it was not until 1758 that the British, under General John Forbes, finally succeeded in driving out the French from Fort Duquesne. The stockade was destroyed, and in its place was erected a moat, stone, brick and earth defense named Fort Pitt. Allegheny County became a separate political unit on September 24, 1788, when the Pennsylvania legislature finally gave in to persistent pressure from settlers in the rapidly growing Pittsburgh area who had difficulty transacting their local government affairs in the county seats of Westmoreland and Washington counties, counties out of which Allegheny County was created. In 1791, Pittsburgh, which had become the chief stopping-off point for settlers traveling the Ohio and Mississippi Valleys, became the county's seat and most important municipality, both strategically and economically. The great difficulty in getting goods over the mountains, the need for resources to wage the revolution, and the requirements of westward travelers for supplies, all contributed to early transformation of the area into a manufacturing center. From 1794 on, when the Battle of Fallen Timbers freed the area of danger from Indian attack, iron smelting, tool making, nail and wire manufacturing, glass blowing, tanning and boat building became important and growing businesses. In addition to supporting important manufacturing activities, Allegheny County also was a rich farming area, and produced a surplus of grain, which could not be shipped back over the mountains because of the expense. Thus, the farmers distilled the grain into readily salable whiskey, which brought badly needed cash into an essentially debtor region. The fledgling federal government imposed an excise tax on whiskey and sent out agents to collect it, to the dismay of distillers, whose profits were endangered. The distillers refused to pay the tax and occasionally tarred and feathered agents to emphasize their displeasure. Finally in July 1794, the issue came to a head when certain local cadres of anti-tax forces came to the aid of William Miller, who was being summoned to Philadelphia for trial. On the site of the Old Stone Manse, in what is now South Park, Miller's neighbors drove off the marshal and the famed Whiskey Rebellion has begun. Farmers demonstrated, taxes went unpaid, and finally, in November 1794, President Washington sent troops to occupy the Monongahela Valley and put an end to the first dangerous threat to the authority of the federal government. After the Whiskey Rebellion, Allegheny County settled down to the business of becoming one of the most important manufacturing centers of the new nation. Nearly all of its early towns were located on the riverbanks. Continued growth of river traffic gradually transformed Pittsburgh into one of the nation's major port cities, a distinction it maintains to the present day. The British and French both were convinced that whoever controlled the confluence of the Allegheny, Monongahela and Ohio Rivers would regulate all rover traffic along the waterways into the Mississippi River and the Gulf of Mexico. Today, more tonnage flows past The Point that through the Panama Canal, and Pittsburgh is the largest inland port in the nation. This fact, coupled with the completion of the Pennsylvania Canal in 1832 and the arrival of the Pennsylvania Railroad in 1852, set the stage for Allegheny County's rise to industrial stardom. Easy access to all the nation's major transportation facilities, plus local deposits of coal and iron ore, stimulated by the Civil War and the need for steel industries gave the county an early ascendance in the iron and steel industries. The Pittsburgh area retained this ascendance during the era of great industrial expansion of the late nineteenth and early twentieth centuries, and bore the label Steel Capital of the World. Allegheny County kept pace with the nation during the past century and often surpassed it in many areas of progress. In medicine, the Salk polio vaccine was discovered here, preventing untold millions from being afflicted with the dread disease, and the community's hospitals and medical centers have earned excellent international praise for organ transplantation. For more than 200 years, many of Allegheny County's prominent men and women have served the nation in its legislative, executive and judicial areas of state and federal governments, including Washington and world capitals. Its citizens have answered every call in defense of liberty and our nation's borders. And with the steel industry declining in demand, the county's progressive citizens look to high-tech, research, light industrial, and service opportunities to maintain its dynamic image and great promise. 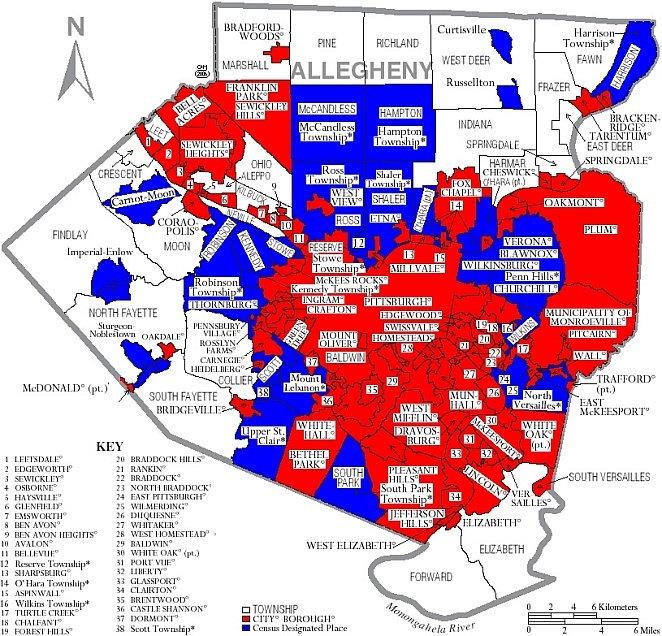 In 1946, county leaders, both political and industrial, led by then Mayor and later Governor David L. Lawrence, determined to renew Allegheny County, mobilized their combined forces and resources and accomplished one of the earliest, most successful, and most significant programs of renewal in the world. What began in Pittsburgh spread throughout the county, renewing, revitalizing and restoring one of the nation's most important metropolitan centers to a place of significance and inspiration to the rest of the world. This renewal continues 50 years later as this amazing region continues to transform and adapt in order to remain vibrant and successful in the new economy of an ever-changing world. Perhaps the most perfect symbol of this ongoing renewal is Point State Park, which has transformed the historic river junction where it all began into the same sort of green, unspoiled place, which the expedition headed by Celeron de Blainville, claimed in 1749. Map of Allegheny County, Pennsylvania, United States with township and municipal boundaries is taken from US Census website and modified by Ruhrfisch in April 2006.